Deception leaves a bitter taste, and is destructive of relationships, reputations and credibility. Unfortunately in recent years we have seen all too frequent attempts at deception in the public arena, often under the heading of ‘spin’. Corporations, governments and media, sometimes acting in tandem have striven to gain advantage by mis-representing or denying factual evidence. It is short term thinking at best, and thankfully there is a growing awareness of the importance of Corporate Social Responsibility. Let’s hope it forms deep roots. Over many years cinema has presented us with numerous examples of characters out to deceive. Some personal favourites in recent times are ‘The Usual Suspects’, ‘Catch Me If You Can’, ‘Insomnia’ and ‘Thank You for Smoking’. The reasons for deceit varied considerably, but the performances were all convincing – as one would expect from accomplished actors. In real life – unless one is a sociopath or psychopath – we are likely to leave a trail of both verbal and non-verbal clues pointing to any attempts to deceive. The key to spotting deception is to become observant enough to note the discrepancies of language and behaviour which act as ‘red flags’. Of course there any many more indicators to look out for. If our suspicions are aroused when interviewing or negotiating we should be alert for sudden or incongruous gestures, movements, or changes in breathing patterns. If we spot any such changes it is important to note where in the conversation they have occurred and what issue was being discussed. Rather than automatically assume that this is a clear sign of deceit we should bring the conversation back to non-contentious issues for a few minutes to allow for a return to a relaxed posture. Only then should we return to the topic which triggered the initial gestures etc. If they are repeated we can then begin to probe directly to discover the underlying cause. It may or may not be deception, but it will certainly be a significant stress factor which can prevent a successful outcome. Double checking like this is important. It both prevents us from jumping to conclusions and clarifies that we have hit a ‘hot’ topic. A one-off shift in posture may be down to physical discomfort or itchy clothing. Politicians are a fascinating study when we look at Body Language, and they frequently reveal very deceptive behaviour. 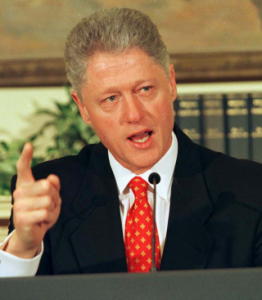 Perhaps the best known example was Bill Clinton denying that he had had “a sexual relationship with that woman…..Miss Lewinsky!” As he spoke he provided two visual clues and one verbal clue that he was lying. He is famously left-handed, but he gestured with his right hand. At the same time he looked to his left, distancing himself from his gesture. To practice your deception-spotting skills I recommend watching politicians when they are making apparently emotional speeches. If you know which is their dominant hand check if that is the one they are using to gesture with e.g. Bill Clinton and Barack Obama are left-handed. Watch the speech first with the sound on, then rewind and watch with the sound off. In particular pay attention to the eyes and the mouth. You may well spot fleeting glimpses, known as micro-expressions, of smiles and smirks, in which case these are red flags – but hopefully your politicians are honest!